Got game? Then get your game shoes on, and they'd best be these awesome Super Mario Bros. themed Chuck Taylor Hi's. Due to be released this July and only in Japan according to current press reports, the shoes celebrate Super Mario's 25th anniversary in fine style. Will they be a hit? I'd say it's a slam dunk! Converse Japan teamed up with Nintendo to ensure Super Mario is paid proper tribute on his 25th birthday. The cool collaboration matches Converse, “America's Original Sports Company”, with Nintendo, developer of one of the most successful characters in video game history: Super Mario. 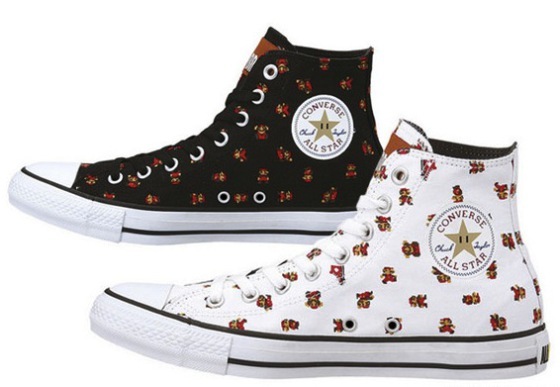 The Super Mario Bros Chuck Taylor Hi features the original NES Mario sprite in a variety of original poses, splashed evenly over a black or white background. The Super Mario logo appears on the tongue, and white soles and toe caps are common to all shoes, black or white. The designers have added a neat finishing touch by replacing the usual logo star on the ankle with the Invincibility Star featured in Super Mario Bros. video games. Rinkya Stores is preparing to take orders for these unique shoes, saying they “will be sure to get them when they are released, your only shot at owning these exclusive shoes!” Hop to it!